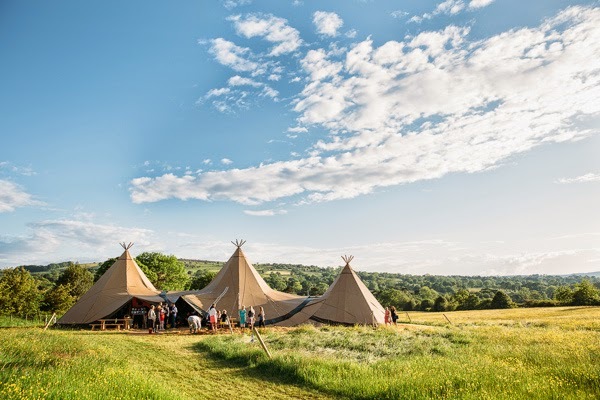 Thanks T, I thought that it was about time we featured a summer time wedding and how better to start than with a tipi wedding from June 2014? 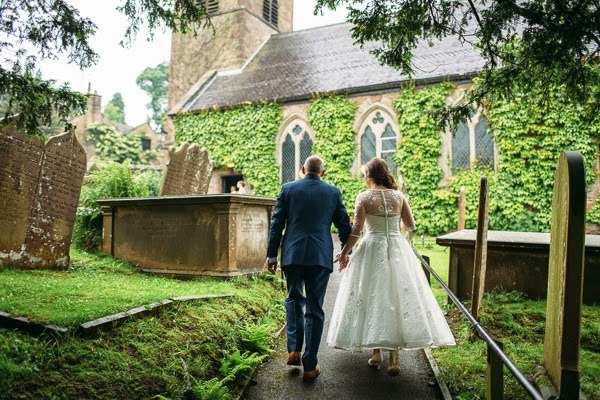 Hannah and Wayne tied the knot in St Michael's Church which looked beautiful all covered in ivy on a gorgeous Summer's day. 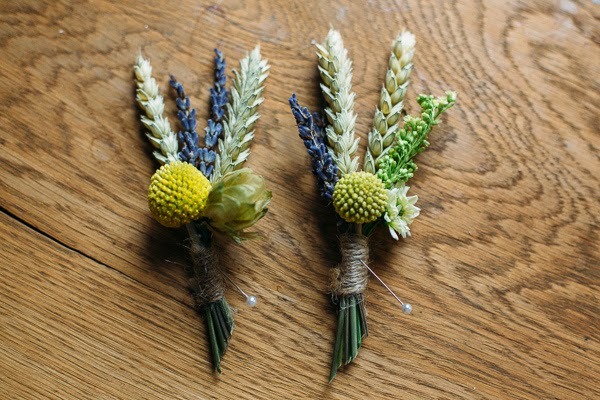 Hannah chose simple bunches of gyp for us to attach to pew ends which accented the venue and didn't detach from it's beauty. 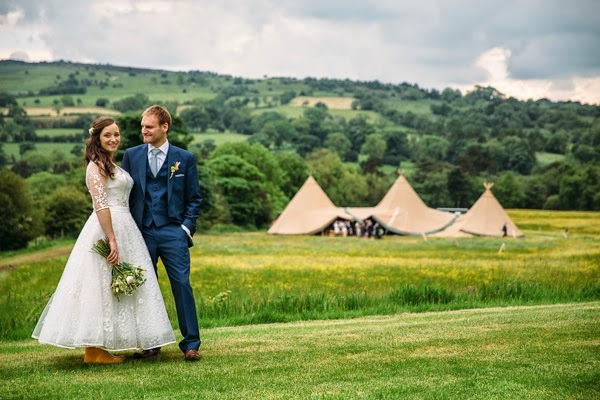 After the ceremony it was then onto the stunning tipi set up at Hannah's mum and dad's house near Heaton House Farm, what a stunningly personal venue! 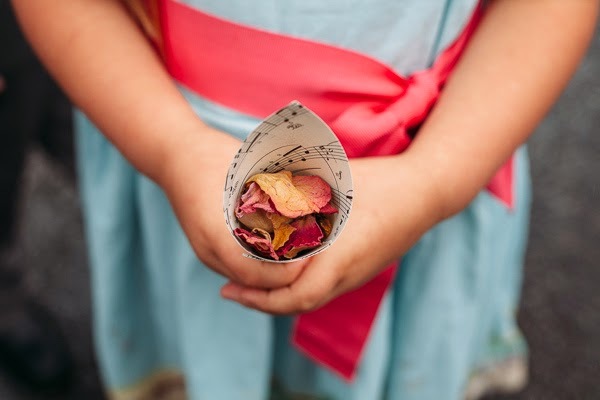 Hannah dried rose petals and popped them into rolled up music sheets, as music is of massive importance to the bride and groom, to use as confetti. This is a great idea as it's biodegradable and doesn't harm the surrounding environment. 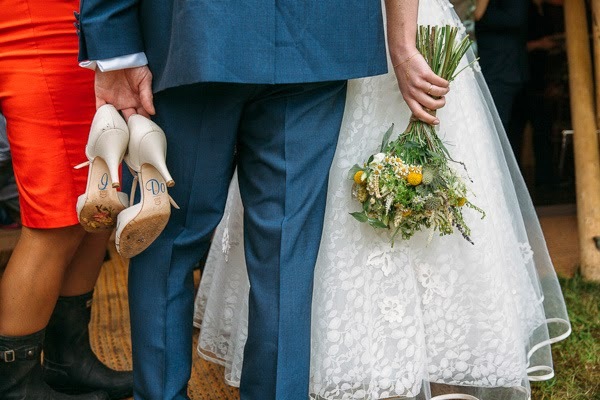 Now for my favourite part, I get to talk about the brides bouquet. 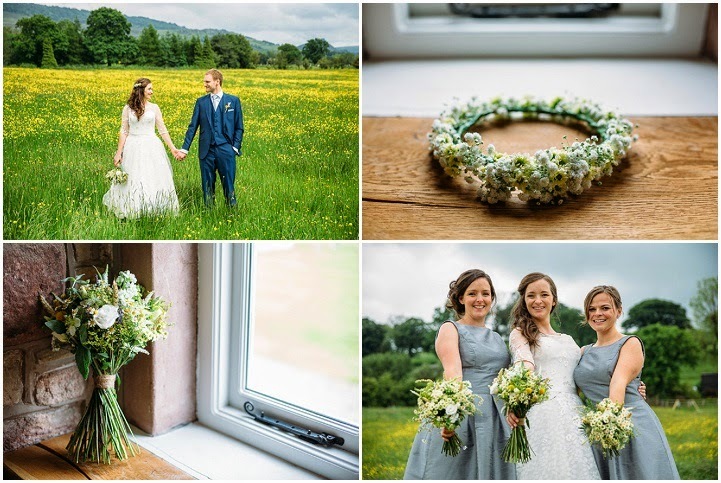 Hannah wanted a just picked, very natural, hand tied posy using meadowy flowers and with lots of herbs. The colour palette was mostly whites creams and greens but with a little pop of colour from the yellow centres of the daisies and a few choice blooms. 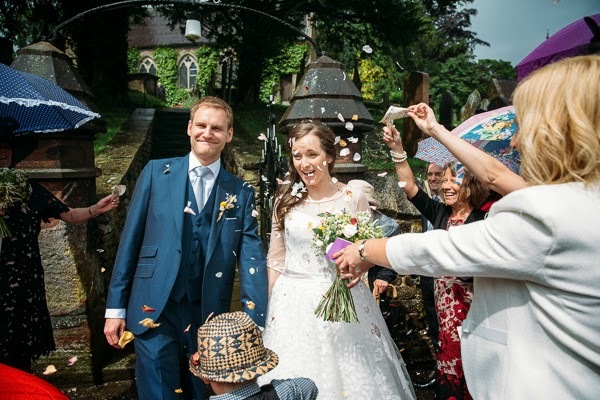 We were asked by the bride to use British and locally grown where possible which suited us down the the ground. 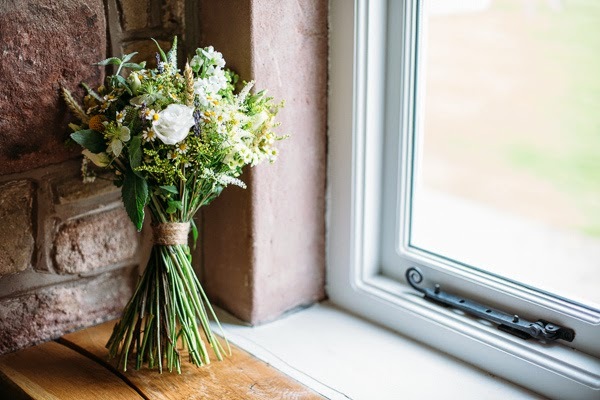 The posy included several varieties of daisies, ammi, hops, tanacetum, vilburnum opulus, gypsophila, white thistles, rosemary, mint, alchemilla mollis, stocks, green bell, wheat, craspedia and astilbe. 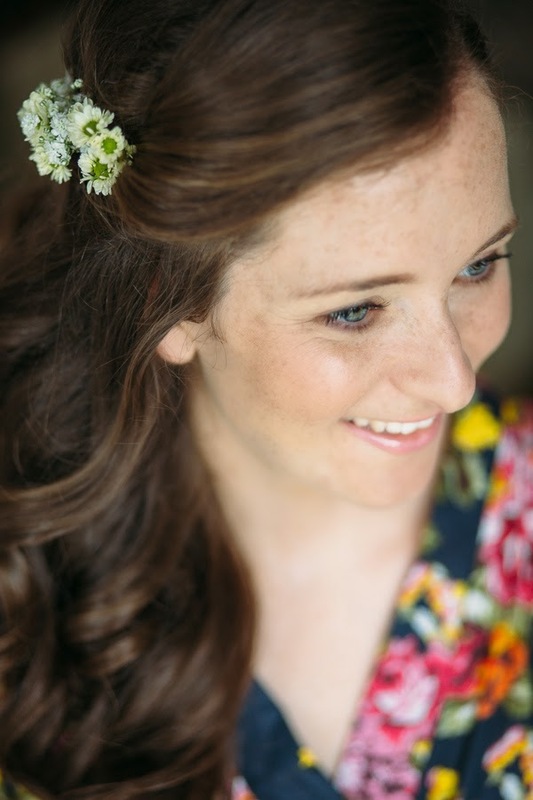 Here is what Hannah had to say recently on Whimsical Weddings blog about us here at Campbell's: "I knew I wanted wild, natural looking flowers, again I didn't want anything too formal or 'done' looking. 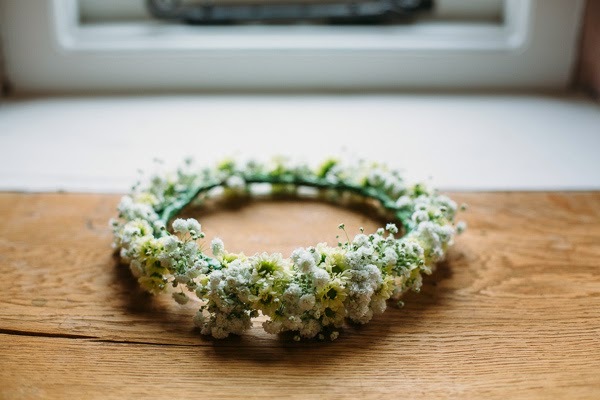 We found Tracey Campbell at a wedding fair; I was drawn to her stand as it was full of wild flowers, exactly what we'd been looking for. 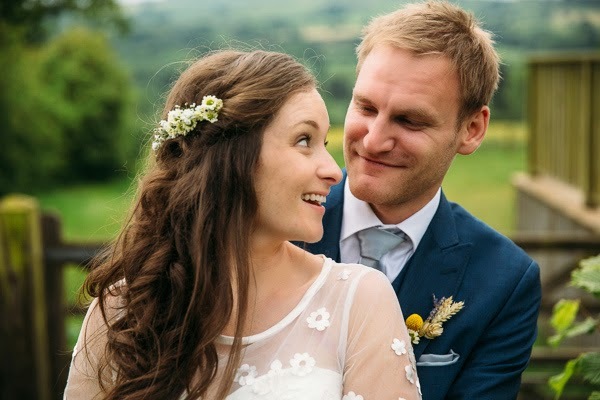 She even managed to get Wayne excited about the flowers as she had loads of hops on her stand and promised he could have some in his buttonhole"
We just love designing hair flowers and were so thrilled when to prepare some daisies for Hannah's hair and make a cute flower crown for the flower girl. 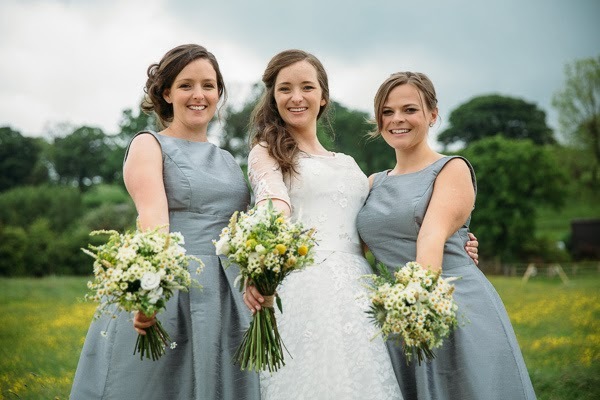 For the bridesmaids Hannah went for a smaller version of her bouquet which worked perfectly with their beautiful dove grey dresses. 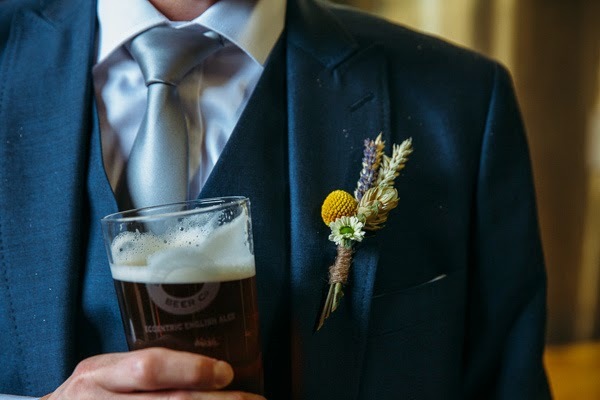 Wayne wanting a sprig style buttonhole including wheat, Yorkshire Lavender, craspedia and as promised hops, as they were really special to him, being a real ale drinker! 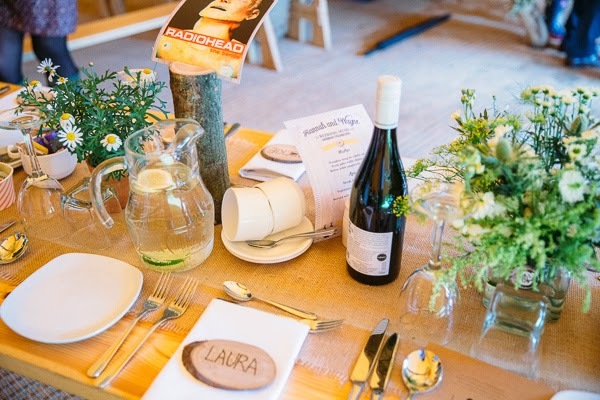 We were also asked to make up some venue flowers in mismatched vases, which we provided, filled with flowers and foliage from the theme and intersperse them with pretty little pots of daisies on the tables in the tiniest of terracotta pots provided by Hannah's Mum. It's at this point we would like to say thanks to Red on Blonde for the fantastic photographs, pop over to their website for a closer look at their work. 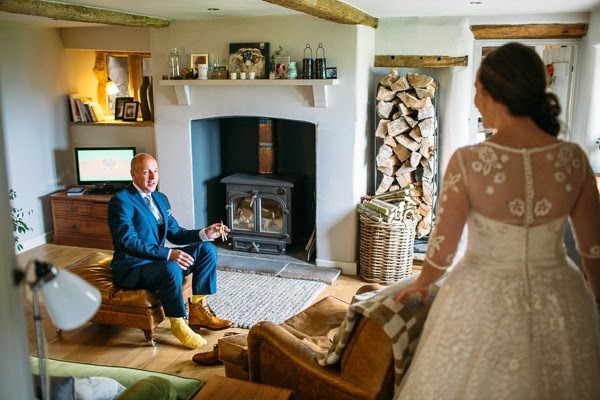 The last photograph we would like to leave you with is one of our favourites and that is Hannah's dad's reaction to seeing her for the first time all dressed up for her big day. 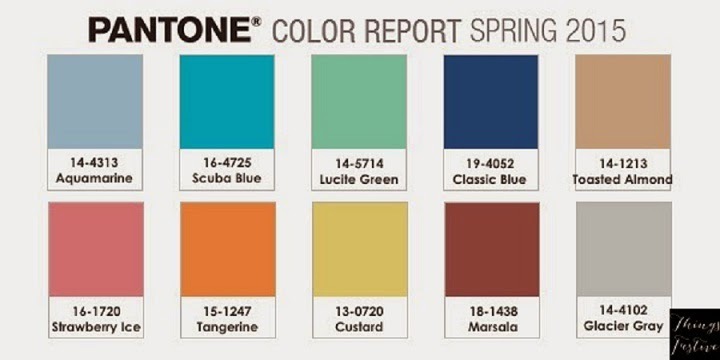 I hope you have enjoyed reading our blog today. If you have been inspired by anything you have seen or read then there are plenty of ways to get in touch including our website or through facebook, twitter, pinterest, YouTube. 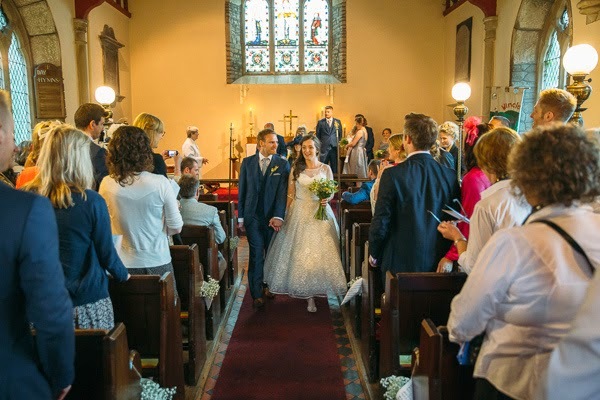 Thanks T, well we love a good winter wedding here Campbell's and Ella and Christopher's was no exception. They really wanted to embrace winter and this reflected in the floral designs. 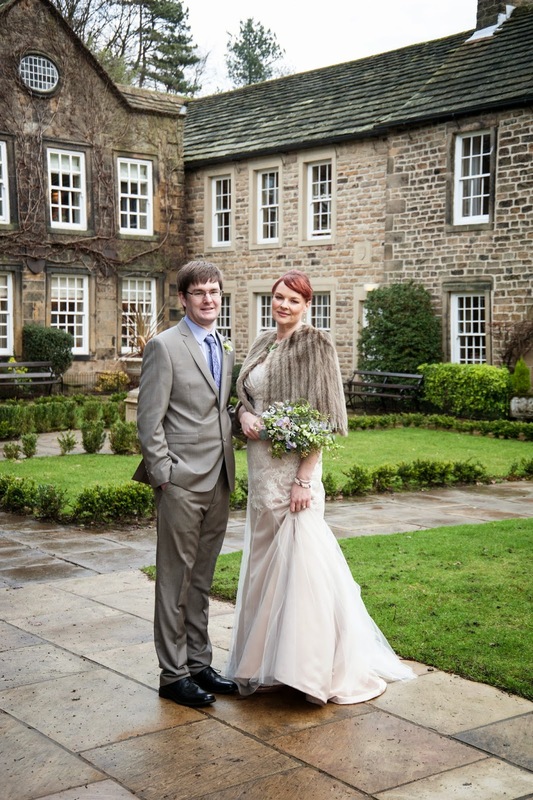 They chose Whitely Hall for the venue which made the perfect back drop and looked fab on all the photographs. It was a very intimate affair with very close family and friends only.